Let’s start this off with a big THANK YOU to everyone that has registered! 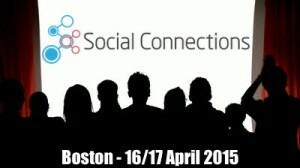 We can, as of today, say that we are sold out for the Social Connections 8 event in Boston. We are so psyched to see the interest in the conference and the team are working hard to put the last details in place before the event. Also, as always, we send lots of love to our sponsors. There are more companies supporting this event than ever before, so we have been thrilled at the response. We really could not run Social Connections without you! The team can really feel our own excitement building up for the event, and we sure hope that you feel the same way. If you have got any questions, do reach out to us via social media or email. The reason we are closing registrations now is due to space restrictions at the venue, we want to make sure that everyone has a seat for the sessions. There’s not much more to say right now except, again, thank you so much, we hope to deliver a fantastic experience for you. And see you all in Boston in just a few days!